The AVO-5-C-P and AVO-5-B-P models are normally used to provide up to 28 Amps into a 3 Ohm load. 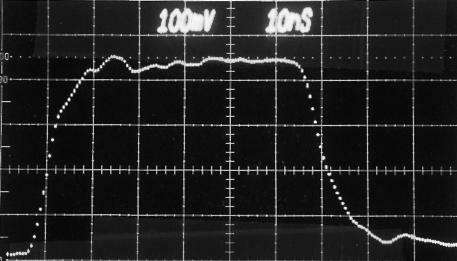 However, these models have a "back-matched" output (that is, ROUT = 3 Ohms) which allows these pulsers to be used with mismatched outputs (RLOAD < 3 Ohms) to boost the output current. The output current can be boosted to approximately 50 Amps (for a zero Ohm load), with minimal ringing. 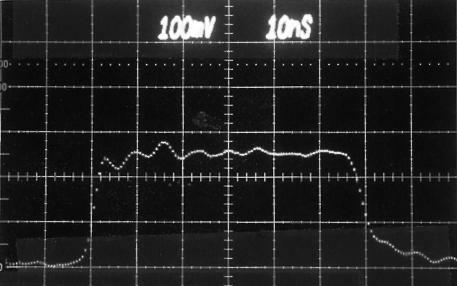 Typical waveforms are shown in the table below. 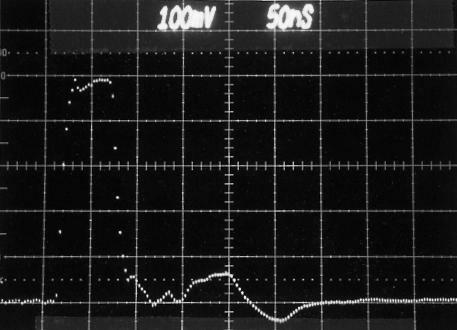 These waveforms are captured using an Integrated Sensor Technologies Model 711 Current Probe. 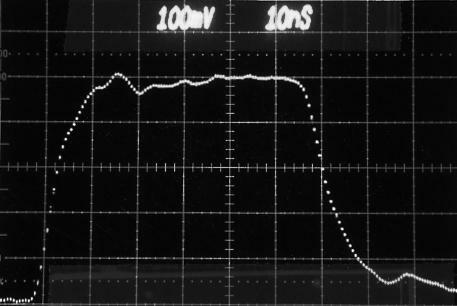 The vertical scale is 10 Amps / div, and the time scale is 10 ns / div, except where noted. For RLOAD = 3.4 Ohms, IMAX = 25 Amps, approximately. For RLOAD = 2.6 Ohms, IMAX = 29 Amps, approximately. 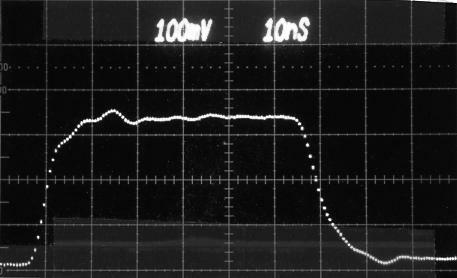 For RLOAD = 1.7 Ohms, IMAX = 33 Amps, approximately. For RLOAD = 1.3 Ohms, IMAX = 36 Amps, approximately. 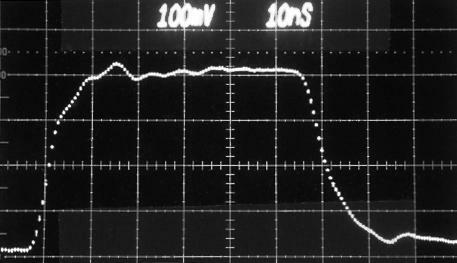 For RLOAD = 0.82 Ohms, IMAX = 40 Amps, approximately. 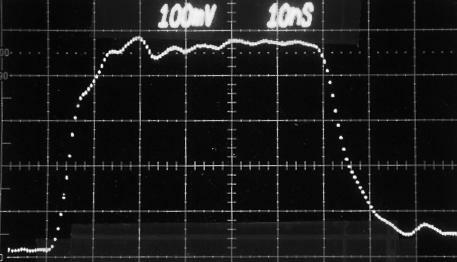 For RLOAD = 0.55 Ohms, IMAX = 43 Amps, approximately. 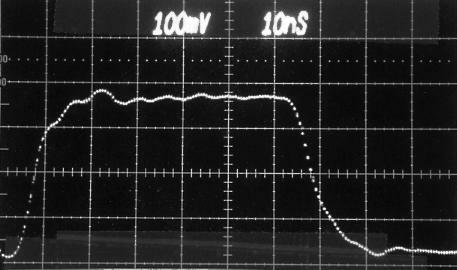 For RLOAD = 0.28 Ohms, IMAX = 47 Amps, approximately. 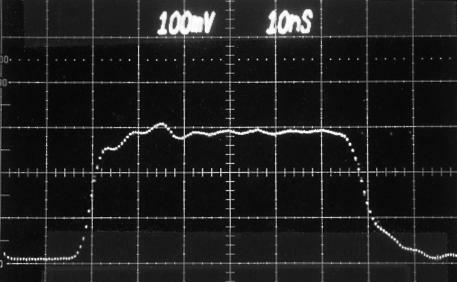 For RLOAD = 0.0 Ohms, IMAX = 50 Amps, approximately. Same as previous photo, but scaled at 10 A/div, 50 ns/div. Contact Avtech for assistance with your special application!